any bowl sufficient in size to contain and work your eggs. Shell boiled eggs. Wash them carefully to assure there is no shell stuck to the eggs and place them in a bowl. Only a few grains of mixed ground pepper (if you like peppered egg salad - remember, eggs have a gentle taste. You don't want to overpower them with pepper. 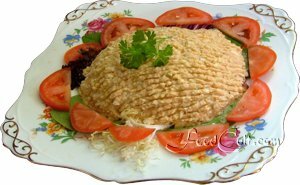 )* Gently stir in the ingredients adding, in very small amounts at a time, additional mayonnaise, paprika, salt and/or pepper as desired. Be careful, at this stage, not to mash, additonally, the egg. Notes: If you are adding ingredients, try adding paprika before adding more salt and/or pepper. Add additonal ingredients in very small amounts at a time. 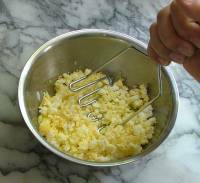 small amount of finely diced celery (1/16" to 1/8" dice) adds freshness and a pleasant bit of crunch to your egg salad - about 1/4 to 1/2 tsp diced celery per egg makes it just a bit different from your every day egg salad. An energy saving tip for boiling eggs: place your eggs in a pot and cover them with water. Put a lid on the pot. Bring the water (with eggs in) to a full boil. Turn the burner off. Let the eggs sit in the water for 13 minutes - leave the pot covered. If you like a slightly softer hard boiled egg leave them in the water for 12 minutes. Experience will teach you how long to leave your eggs in the water to achieve your prefered level of "hardness". Try your egg salad with pickled eggs (but drop the paprika). 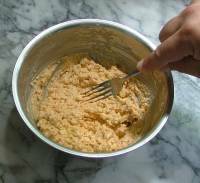 Egg salad or "chopped egg salad" is an easy dish to make. The key to good egg salad is remembering that the flavour of the egg itself is very gentle and cannot handle competition. Additional flavours must be gentle. They must blend and play with the egg - not compete for superiority.